According to Google, Android was designed to give mobile developers "an excellent software platform for everyday users" on which to build rich applications for the growing mobile device market. The power and flexibility of the Android platform are undeniable, but where does it leave developers when it comes to security? In this talk we discuss seven of the most interesting code--level security mistakes we've seen developers make in Android applications. 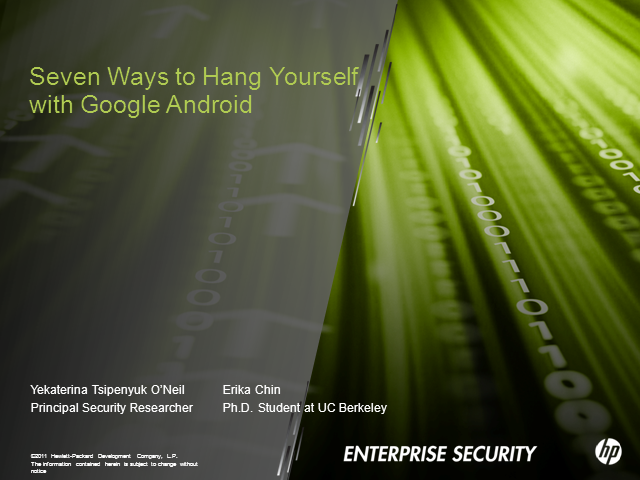 We cover common errors ranging from the promiscuous or incorrect use of Android permissions to lax input validation that enables a host of exploits, such as query string injection. We discuss the root cause of each vulnerability, describe how attackers might exploit it, and share the results of our research applying static analysis to identify the issue. Specifically, we will show our successes and failures using static analysis to identify each type of vulnerability in real-world Android applications.